Munir Majid, head of ASEAN Business Club speaks at a meeting to boost Malaysia-Vietnam trade relations in Hanoi on Thursday. HANOI — Munir Majid, President of the ASEAN Business Club, proposed on Thursday the listing of regional infrastructure projects to boost liquidity. “There are a few very bankable projects,” said Munir, suggesting that their flotation on regional stock markets would stimulate foreign direct investment. At a business roundtable organized by the ABC and its Kuala Lumpur branch in the Vietnamese capital, officials and company executives spoke about the need to raise investment. Malaysian and Vietnamese officials said both countries should look at opportunities in sectors such as energy and food processing to achieve their trade targets within the regional economic pact framework. “Our economic cooperation has improved step by step, but we have not explored the potential to the fullest,” said Do Thang Hai, Vietnam’s deputy industry and trade minister. According to Do, Vietnam enjoyed higher growth when the communist country adopted more open economic policies and free trade deals. Annual gross domestic product growth has reached almost 7%. To maintain the momentum, Vietnam wants more trade with Malaysia in power generation, minerals, agricultural machinery, and food processing. Bilateral trade quadrupled in a decade to $9.3 billion in 2015, making Vietnam Malaysia’s 13th largest trading partner. Trade mostly comprised electrical and electronic products, petroleum, palm oil, and textiles. The countries upgraded their bilateral relationship to a more inclusive “strategic partnership” last year, and have set a target of $15 billion by 2020. Malaysia is the seventh largest source of foreign direct investment in Vietnam, with a total in place of $12 billion in September. 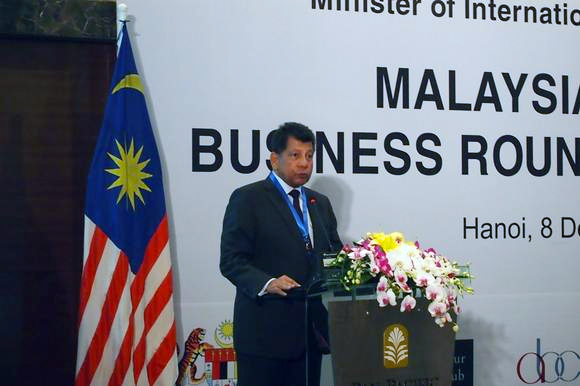 Mustapa Mohamed, Malaysia’s minister of international trade and industry called on both countries to up their game. “We have to leverage on working as a team — both the public and private sectors,” Mustapa told reporters. Zafrul Aziz, chief executive of CIMB Group Holdings, sees a lot of potential in Vietnam with its growing population. The Malaysian banker will officially launch wholly owned CIMB Vietnam on Friday. He described the country of over 92 million as the “next Asian tiger” — following in the footsteps of Hong Kong, Singapore, South Korea and Taiwan.